Samsung’s brand recognition is once again paying off as an unnamed Samsung executive says the handset is the fastest selling in company history. According to the exec who spoke to Korea’s Chosun Ilbo newspaper, the company shipping four million Galaxy S 4 units between April 26th and April 30th, and as of May 10th has already shipped more than 6 million. We should highlight that shipped doesn’t necessarily mean sold, but the figure itself shows that those carriers buying up Galaxy S 4 units have plenty of belief they can move those units. Samsung’s loves highlighting sales milestones for Galaxy units so I imagine this isn’t the last story we’ve written about impressive Galaxy S 4 sales. In fact, I’m betting Samsung is just getting started as they expect to hit 10 million sold before the end of May. 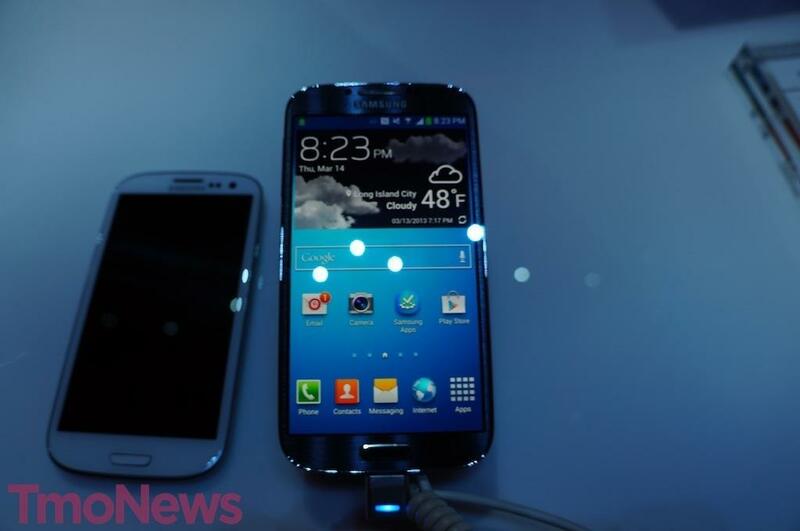 ← Samsung, Google To Announce “Google Edition” Galaxy S 4 With Stock Android? In all seriousness, though, that’s cool. I hope they continue to make great phones & enjoy more success in the future. so where are the HTC ONE numbers lol? Is today (5/15) still the in-store date (across all TMO-owned stores) for this phone? That’s what I was told Saturday (5/11) in a TMO-owned store. and i repeat what i said when these two phones were announced, the HTC One has no chance against the S4. aluminum, four speakers whatever .. only a small niche of people care about such things .. it’s about name, features and history .. HTC has little of any and a horrible history when it comes to support. Poor brand exection. All HTC phones ever sold by T-Mobile never had the HTC logo up front. The HTC One is the first. And they’ve been selling HTC since the HP iPaq days (yeah it was an HTC device). No brand-awareness. yep hard to argue against that .. i’ve always said their branding was just a bunch of confusion and fail. as such i knew the One wouldn’t make a dent into Samsung’s grip. Another reason the HTC One has no chance (at least on T-Mobile) is because as of today the damn thing still isn’t even in stores. I went into my local TMO corporate store today to buy the One. No One, no S4, and $50 more for the fruit phone. I also should mention 4 employees and I was the only customer. The store was dead. Thats because it was only going to select Tmobile stores. They’re depending on online sales to pushe these devices more. They’ve said so many times before they’ve gone on sale. You Samsung fanboys are more stupid than the Iphone fanboys. The One wasnt going to outsell the GS4. Only people like you believed that. THe One is sucessful in its own right. though. Regardless of Your feelings. HTC has a hit. No, HTC knew it wouldnt sell as many as the GS4.What it did was get HTC brand recognition. And a sucessfull multiple carrier launch. Thats a succees for them as they’ve not been able to do that for year. And it wasn’t geared towards people like you that are Samsung mouthpieces. HTC One is a success. Just because you think its a fall because it didnt compete with the GS4 numbers. It never was expected to. And people like you continue to drink the Samsung koolaid. Just because they sell more devices doesnt make it a better device. Just ask Apple. Did you even read his post? He said the HTC One had no chance of selling as much as the S4. Did you read mine?I wasnt talking to you. Step off. Yes, I read yours. Clearly, you have a problem with Samsung, but those first two sentences make no sense in conjunction with what the other guy was saying. Also, I really don’t care who you were talking to. This an open forum. I’ll say what I want to who I want. Like I said I wasnt talking to you. And if you don’t care then STFU. I dont’ have a problem with Samsung. I DO have a problem with someone jumping into my post when it wasnt directed to them. Didn’t ask for your input. So close your hole. Unless you actually plan on using some sort of forceful action to MAKE me close my hole, there’s no point in your “internet gangster” talk. This is an open forum. I can choose to speak to whom I please whether they asked for my input or not. People like you crack me up. I’m 6’4″, 225lbs., & I played college football. I assure you you wouldn’t boss up to me in such a manner if you were standing right next to me. Your thoughts, and opines, are NOT needed, wanted or requested. Are you hard of hearing? Internet gangster talk? You stuck your nose in this when I wasnt even referring to you. You get what you asked for. If you can’t shut it, thats what you get. I wasn’t TA L K I N G TO YOU. Do you understand that fool? And do you REALLY think you intimidate anyone because you’re larger? I don’t care if you’re a little person, you still need to close your mouth when noone is talking to you. You don’t seem to get that. And you crack me up too btw. Because your size doesnt scare anyone. I will continue to speak for as long as I want. You can’t make me stop. And of course my size doesn’t intimidate you. You’re sitting in front of a screen. And I’ll continue to tell you to shutup. You can’t make me stop that either. And you’re sitting in front of one too. So? I would just stop trying to fight him. He’s obviously just an idiot/troll that’s trying to get you angry/stressed. Yeah. This is about as fun as getting hit with the sharp part of the hammer. I’m over it. Whomever you are. I don’t care how big you are. It doesnt change the fact that I wasn’t talking to you. Dont care what you have to say, or want to hear it. So guess what you get to do? STFU. Internet gangster talk. What ever. Thats what you seem to have a difficult time grasping. i dont care what you have to say. Your opinion is meaningless to me and so is your size. As if that’s supposed to intimidate. Nope, not scared. You can still shut up though. not to mention i don’t even own a Samsung phone lol .. i have an HTC One S. but hey, it’s the Internet .. he wins. I’m very excited to see that Samsung is still setting new records (though not sales). I hope they continue to expand their empire at the expense of HTC. Successful manufacturers don’t just implement change just for the sake of it. 6 million idiots and counting. seriously as long as its a gs4 they dont care for the plastic housing o ther 8 gb of space. Another example of good marketing execution. Brand equity wins in this case. Same goes for Apple devices. I bought your mom an S4 for her birthday…..
I’m curious to know why you think a plastic housing is so bad. GotDamn Sammy!!!! Keep up the good work…..I can’t wait to get my hands on the Galaxy Note 3 later this year….YAY!!!! Its still not better than the One. what weather app is on the phones screen?? ?